The morning’s broken light created shadow play across the landscape and sea. So often in landscape photograph, shadows are edited out so that we can have a better view of the whole scene. It is a mistake I think to give the viewer a world without the benefits of shadows. The way the earth and clouds gallop across our landscape is a specific relationship. Time of day, the time of year and even geographic information is hidden in these shadows. Here in my latest photograph available at RedBubble I give shadows a deep bow of gratitude. 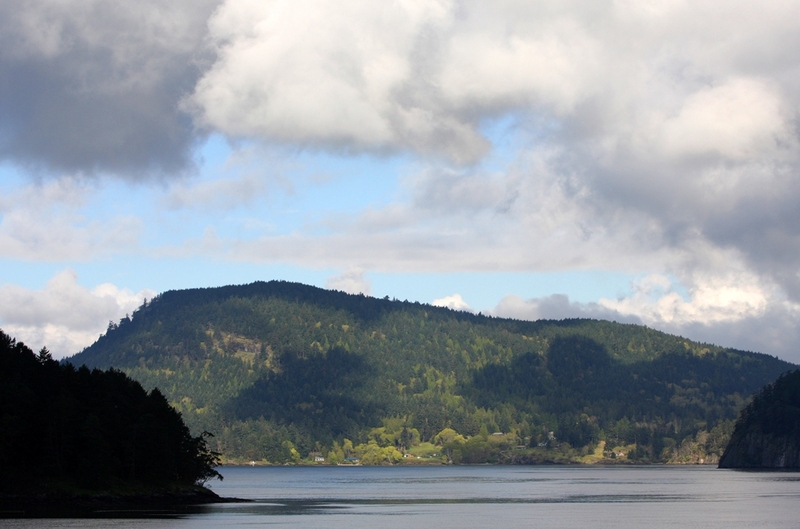 We know it is early spring in the Gulf Islands as we gaze into Active Pass from Mayne Island. We know from the slight haze that there is brush from winter storms being burned on various properties in the near vicinity. We might guess it is unsettled weather flirting with us in the morning light. Shadows are all part of this knowing, this experiencing of the landscape. We might think such understanding is no longer relevant or important. After all, who is going to plant their early onions using this information? Who will wants to know that it must be just about time for the Chocolate Lilies to bloom? Well, me of course. ← More Canadian Landscape paintings by Terrill Welch SOLD!